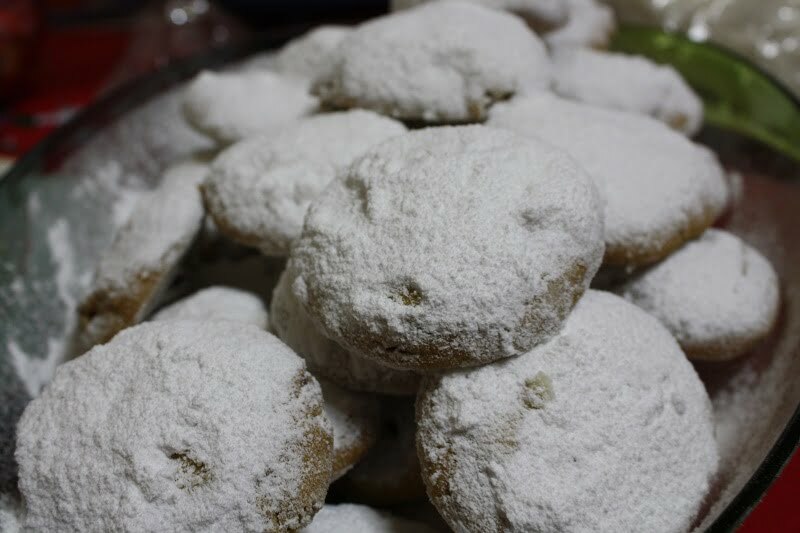 Kourabiedes are Greek cookies, similar to shortbread cookies which are flavoured with vanilla, filled with toasted almonds and when baked they are coated in icing sugar. There are many recipes for kourabiedes but the main ingredient which gives this traditional Greek cookie its taste is the Greek ewe’s and goat milk butter. However, if you cannot find Greek sheep’s butter you can also make them with any other butter you usually use. I have made kourabiedes quite different this year after watching a Greek cooking show by Stelios Parliaros, a famous Greek pastry chef. I mixed in some pistachios as well and used real vanilla pod, added rum and they were fantastic. If you want a more traditional recipe, see my last year’s post here. The only difference I made to his recipe was to add pistachios in half of them. To make these cookies, I start by roasting the almonds (with skin on) and the pistachios so that they cool before using them. You can roast them ahead but I usually do this when preheating the oven. I roasted them separately in two tins as pistachios need about 8 minutes and the almonds around 15 minutes, stirring them a couple of times. I used the Paddle Beater Attachment and I beat the butter with icing sugar for almost half an hour, until the mixture was light and fluffy. The traditional flavour for kourabiedes is vanilla. To flavour them, I used a real vanilla bean. Vanilla beans are quite expensive, so feel free to substitute them with either vanillin or vanilla essence. To cut open the vanilla bean, use the tip of a sharp knife and cut along the bean. Using the knife to scrape the seeds and this is what to use. The seeds of one vanilla bean are equivallent to about 3 teaspoons of vanilla extract, depening of the size of the bean. Once split open, the seeds must be used, as these cannot be stored. However, if a recipe calls for one teaspoon of vanilla extract, just cut 1/3 of the bean and then split open just this piece. Wrap the remaining piece in cling film and store in the refrigerator. Do not discard the used part. You can put it in a jar and fill it with sugar. Leave it there for about a month so that the sugar is flavoured and then use this sugar in your desserts. Next step is to combine all the dry ingredients. Put the flour in a bowl and add the baking powder, salt and vanilla seeds and mix. Lower mixer speed and then add the flour mixture until incorporated. Usually an alcoholic drink is added to kourabiedes. Parliaros chose to use rum, which I happened to have at home. The traditional alcohol used is brandy or you can use any other liqueur. After the addition of the rum, stop the mixture to check the cookie dough. Test it with your fingers. It should be a soft dough which does not stick to your fingers. When the nuts cool, coarsely pound them with a pestle and mortar or in a food processor. You can mix them all in the mixture if you like but I prefered to use them separately to make two different kinds. I divided the dough in two parts and in most of the dough I added the almonds and in the remaining the pistachios. To distinguish them, I made the ones with the almonds round and baked them on a baking tin lined with parchment paper. The ones with the pistachios I gave them a crescent shape, which is more traditional. Be careful not to make them too big as they will expand when baked. Make them about the size of a walnut and space them 3 – 4 cm (about an inch or more) apart. Bake them for 20 – 30 minutes, depending on their size and your oven. Let them cool and turn them oven. Sieve some icing sugar and them turn them over. Sieve more sugar on top and place them in a platter. Leftover icing sugar can be reused by sieving it again. These kourabiedes are adapted from the famous Greek pastry chef, Stelios Parliaros. Preheat the oven to 180 degrees Celcius and toast the pistachios for 8 minutes and the almonds for 15 minutes. Set aside to cool and coarsely pound them. Attach the paddle beater to your mixer and beat the butter and sugar on high speed, until light and fluffy. Combine flour, baking powder, salt and vanilla seeds. Lower mixer speed and add the dry ingredients, mixing until incorporated. Add the rum and mix for another minute until it is absorbed. Finally add the nuts and mix again. Line a baking tin with parchment paper and shape kourabiedes in whatever shape you like. Bake for 20 - 30 minutes, depending on your oven. Let them cool and turn them over. Sieve some icing sugar to coat them and turn them over. Sieve some more sugar on top. Put them in a platter and sieve the leftover sugar on top. Store them in an airtight container to keep them crunchy. That’s roughly the same recipe as my Mama, except that she doesn’t use vanilla nor pistachios, and uses Metaxa instead of rum. We tried chocolate κουραμπιέδες last year and tried doing them for the first time yesterday. They turned out pretty good! As I said there are many recipes for kourabiedes and the ones I made last year are like the ones your mum makes. In Greece they never make chocolate kourabiedes or melomakarona but after the holidays when the confectioners or bakeries have leftovers then it’s the time your see them covered with chocolate. I was thinking of making some of both with my leftovers. Yes, I know there are probably as many κουραμπιέδες recipes as people making them. But what I meant was that those we tried last year were not covered in chocolate. It was regular κουραμπιέδες, except that the baker had added either melted chocolate or cocoa powder, and then they were rolled in a mix of icing sugar and cocoa powder (her friend had bought them from a pastry shop in Μαρούσι called Αγαπητός). The chocolate κουραμπιέδες we did this year was a recipe from my great-grandmother, who was Greek from Turkey,and they’re not covered in chocolate either. Anyway, thanks for the recipe. Thanks Aline for the clarification. The addition of cocoa powder sounds very interesting. Happy Holidays. Sounds and looks delicious. I may have to try these with the rosewater idea. Merry Christmas Ivy! Ivy, I would love to get a hold of some sheep’s butter…how very authentic. Kourabiedes complete the Greek Christmas and I do like very much your addition of “fistikia”. Ivy – you’re such a good baker. The ingredients in this cookies are yummy. The pistachios sound good and definetly would win me over! I love how there are so many recipes for these…I have some serious catching up to do! First of all I have to say excellent photos sis. On the Food Network I watched Paula Deen make these cookies. Of course they were called something else but the ingredients (minus the sheeps butter) were the same. Funny how traditions are made. I really like the idea of the pistachios – your cookies are beyond fabulous. So when I get to Greece (hopefully in this lifetime), these will be waiting for me….right? I love any kind of wedding cookies and these sound delicious! I love that you add rum! That must give them a very unique taste. Ivy they are wonderful! I love the pictures! !Have a wonderful Christmas Ivy! What gorgeous cookies Ivy – and with pistachios and rum, how could you lose? Oh wow looks gr8. Awesome festive cookies. I love pistachios too… first time I baked kourabiedes, I don’t have some of the ingredients and never tasted actual kourabiedes before. In the end I added in homemade vanilla extract and brandy. It tasted wonderful and was the first to finished compared to other cookies… I think my next cookie test-drive will be the Cyprus version but I don’t have orange flower water… so I guessed I have to use Rose water instead. Ivy these kourabiethes sound fantastic , my friend put pistachios in their shortbread type biscuits and they are lovely, I will try your recipe , I'm not sure where to buy the sheeps butter from , would it be from a deli ? Morfoula, I see from your e-mail that you are from Australia. Is there a Greek community where you live? Greek stores may have some. Australia has a lot of sheep, so there is bound to be some ewe's butter, may be as you say in a deli shop. Now, if you don't find any use cow's milk butter. They will not be the same but still delicious. I’ve been meaning to write to you a million times since the last time we spoke back in ’08, I think. This time I’m writing to ask you about eggs in this recipe. It fascinates me that some recipes include them and others (like yours and Parliaros’) don’t! I have scoured my recipe books (many are greek, others are aglo) and the internet and I keep seeing this eggy phenomenon. Some suggest one egg yoke, others two, others again the complete egg! What’s the story with this ingredient? I can accommodate all sorts of variations to a recipe but eggs terrify me if I don’t know what purpose they serve here and what happens when they are either included or excluded. Could you help me with this question please? I’ve just been given the command to make about 100! I’ve done this before but was always tentative about the eggs. What do you suggest? It’s wonderful to hear from you again after so many years. There are many reasons why eggs are added in a recipe. It could be for extra moisture, as a levening agent or as a binder. In kourabiedes I have made them, both with and without eggs. Adding egg tends to make a cookie more cake-like so no egg means a crunchier and thinner cookie (because it will spread more), in general. The white part of the egg has a drying and leavening effect wheareas the yolk has fat and so produces a richer cookie. So adding the extra egg yolk adds a richer and more tender texture to Kourabiedes. I prefer the ones without eggs. Profuse thanks for this wonderfully clear explanation, Ivy. I was always baffled by this little variation in the recipe. I understood well the use of eggs in every other recipe I’ve tried but with kourabiedes I was totally out of league! Your site, Ivy, is a wonderful resource for humble cooks as well as for lofty chefs around the world because it isn’t simply a library of recipes but also quite a scholarly look at what is behind those recipes. It is truly a mine of culinary information. I have often given the link to people I connect with in many other blogs and my daughters are always gravitating to your pages! Again, Ivy, many thanks for your clear explanation of my question. All the very best to you and to your every effort and good luck with the new book. Thank you George for your kind words and I am deeply honoured to be acquainted with you. Always glad to help if you have any other queries. Delighted to refresh our acquaintance. Oh, incidentally, yesterday I’ve made a few phone calls around Melbourne to the major supermarkets and the Greek delis re the question about sheep butter but, from what I’ve gathered there is no supplier, at least not here, in Melbourne. Not enough demand apparently and so the product’s use-by date would expire on the shelves. Pity because I’d like to try it. Regarding sheep’s butter, maybe it’s the wrong time of the year. Even in Greece we don’t see it around all the time. It comes on the shelves mostly around the Christmas period. I am surprised with such a big Greek community not to have sheep’s butter considering that so many sheep are bred in Australia and New Zealand. Have you tried calling local dairies? Meredith Dairy seems to be in your region. May be if you call them they can tell you if you can find some.